Hulk: Indestructible force more weapon than man. Banner: Smartest man alive. Combined, they are the strongest, smartest weapon on the planet! 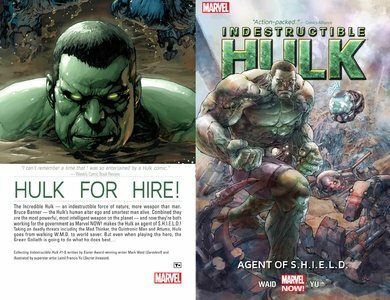 And NOW!, the Indestructible Hulk is an Agent of S.H.I.E.L.D.! Hulk's first official missions include taking down the all-new Quintronic Man and battling Attuma on the ocean floor! Plus, Iron Man guest-stars!